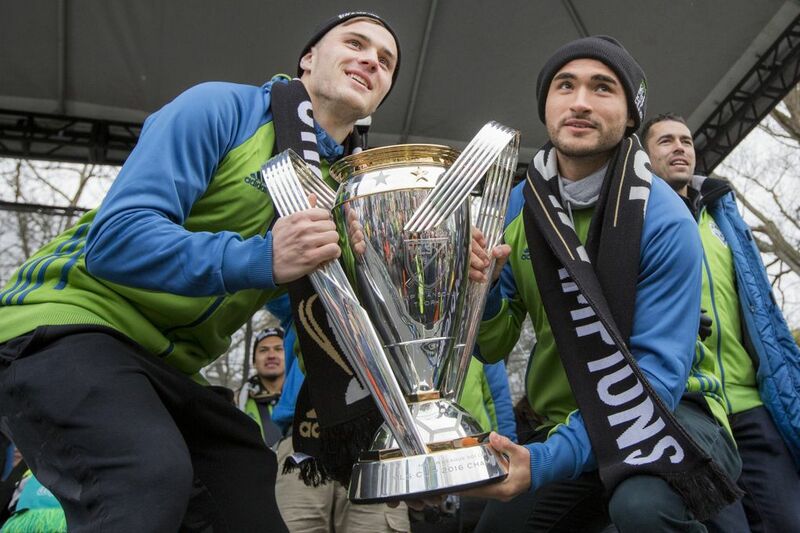 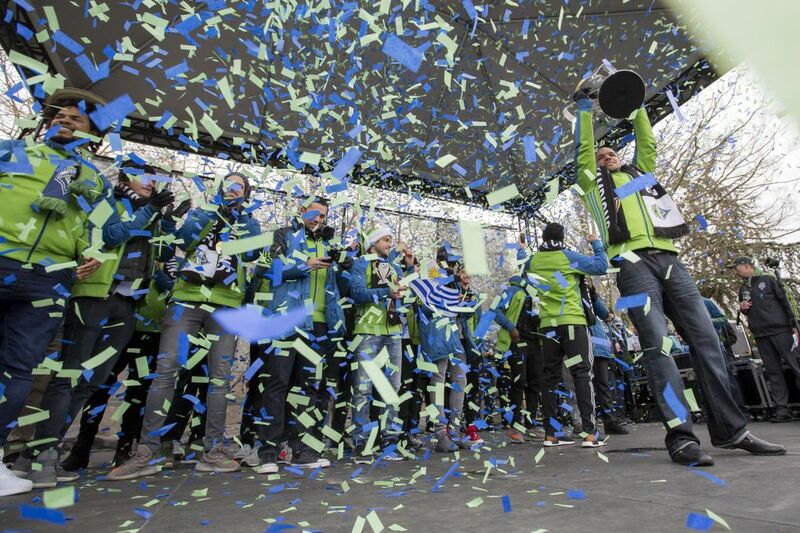 Seattle Sounders FC won its first MLS Cup championship on Saturday in a penalty-kick shootout with Toronto. 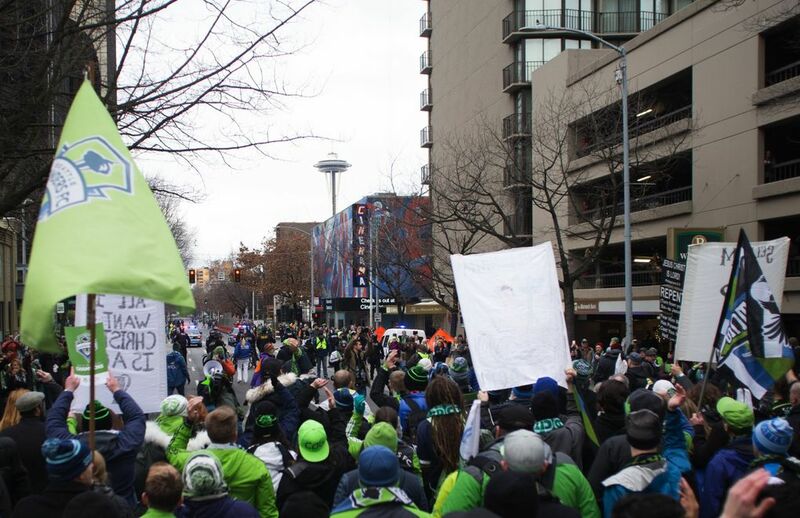 Follow us during the victory march and rally in Seattle on Tuesday. 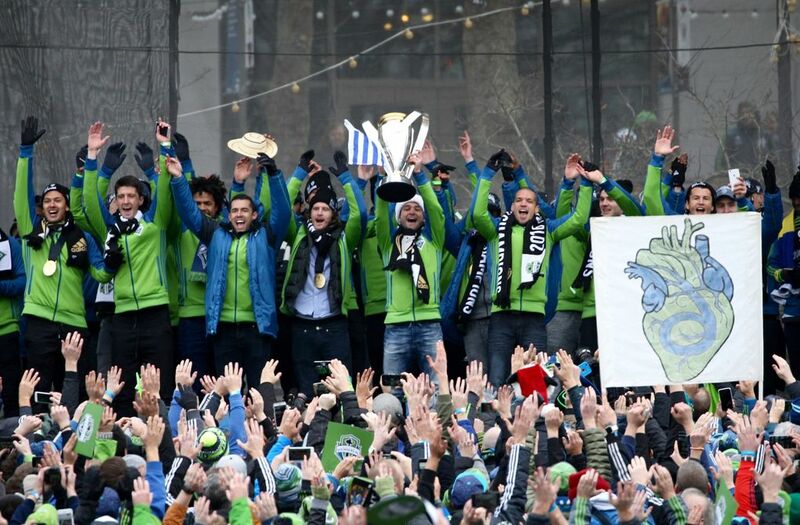 Seattle Sounders FC defeated Toronto FC in dramatic fashion on Saturday, winning the first MLS Cup in team history. 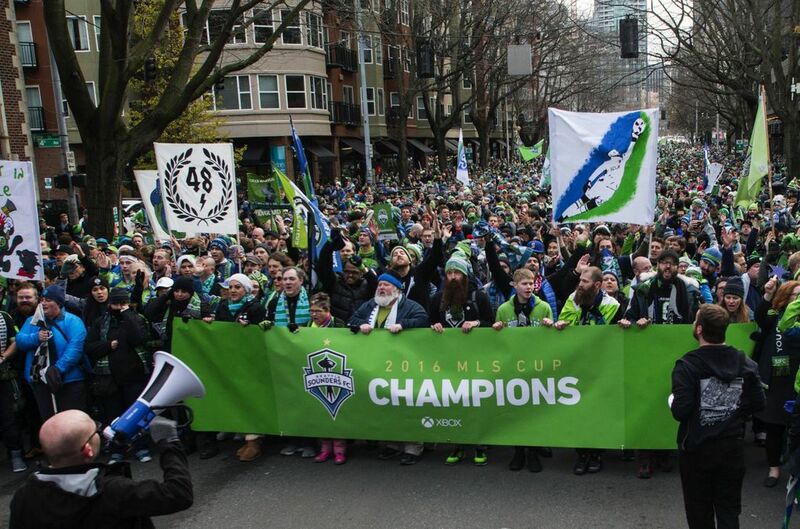 To celebrate, the team will hold a march and rally Tuesday. 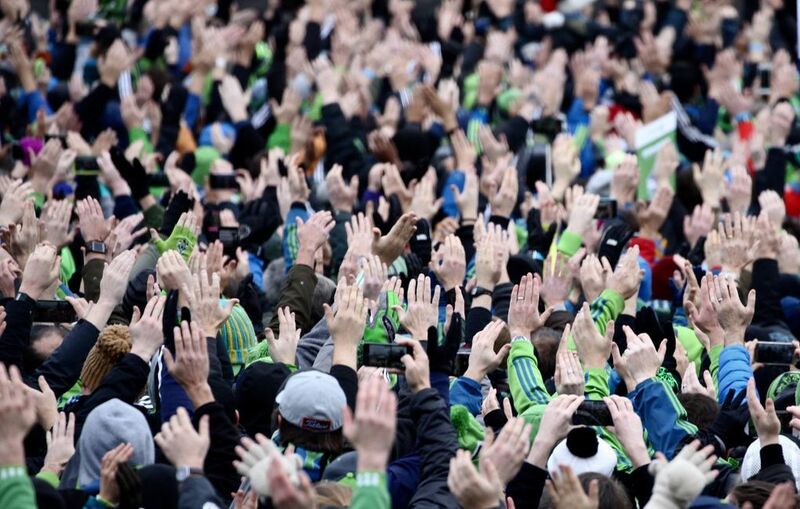 The march begins at 11 a.m. at Westlake Park and ends at the Seattle Center with a rally. 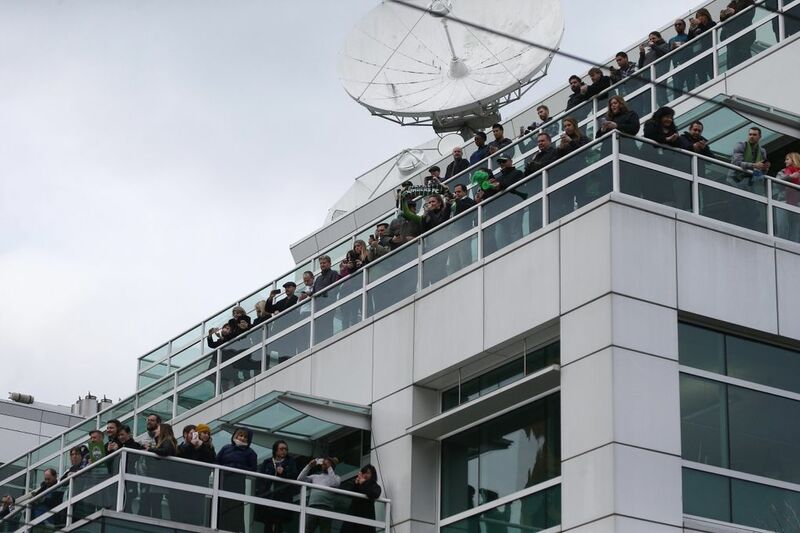 The Seattle Times has several reporters and photographers on the ground. 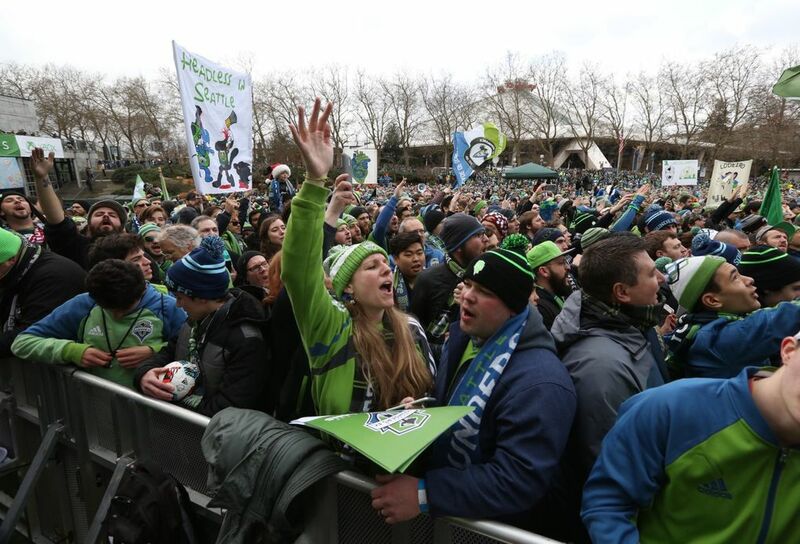 Follow us live. 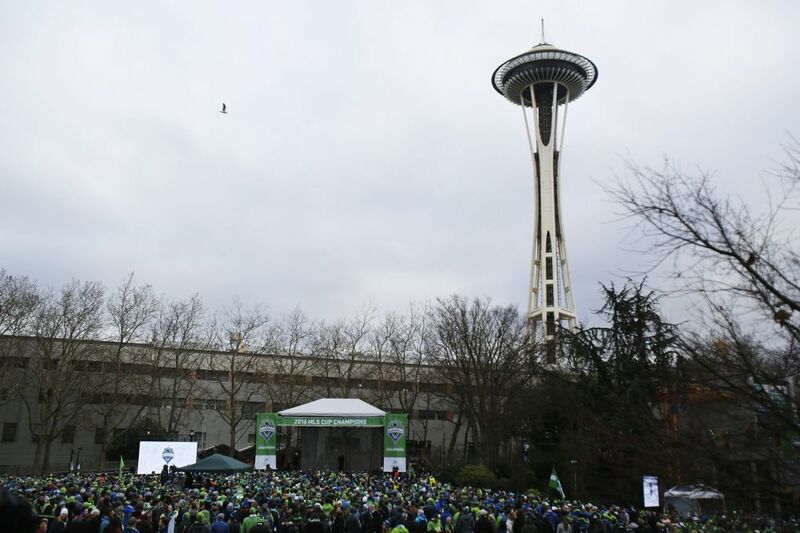 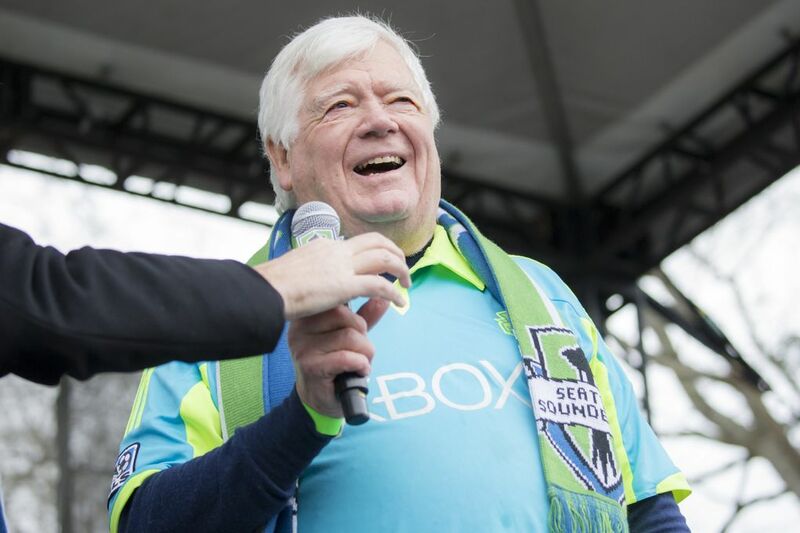 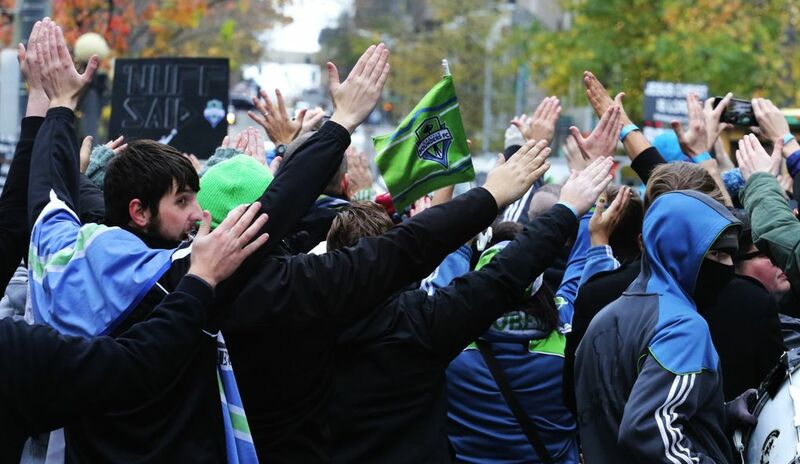 A rally that saw singing, chanting and jubilation from the champion Sounders and their fans at Seattle Center has ended. 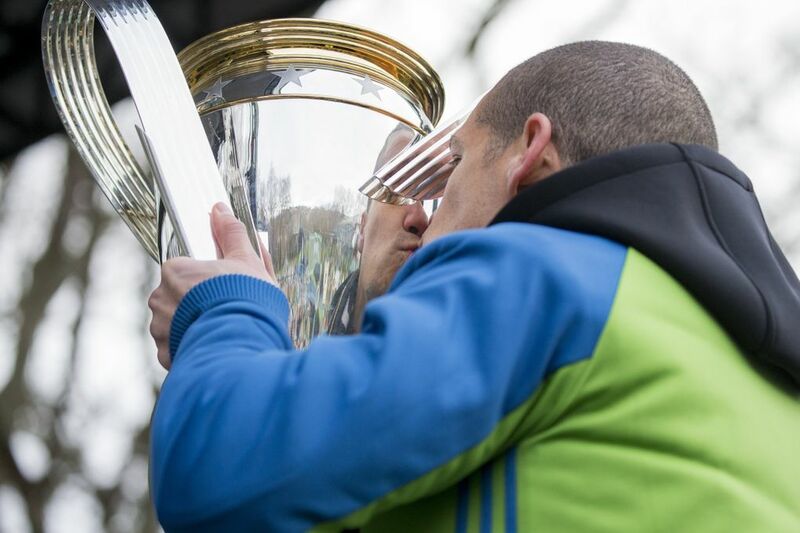 Clint Dempsey: "Now that we won one, Portland can't say s—." 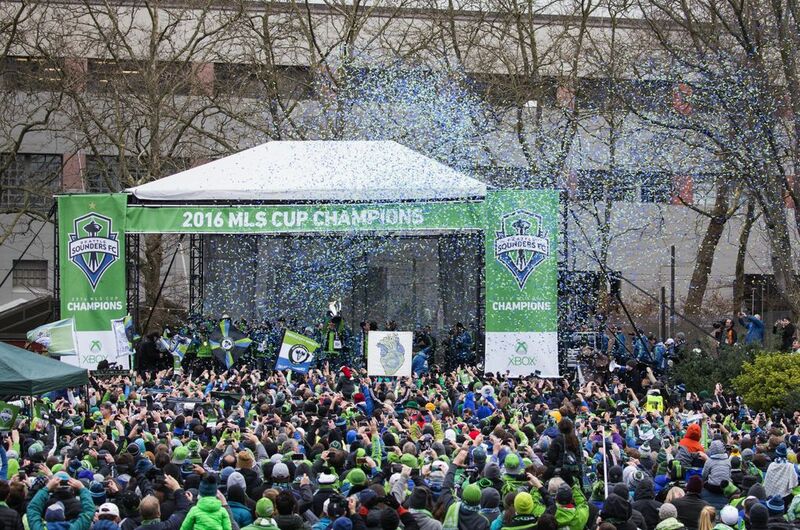 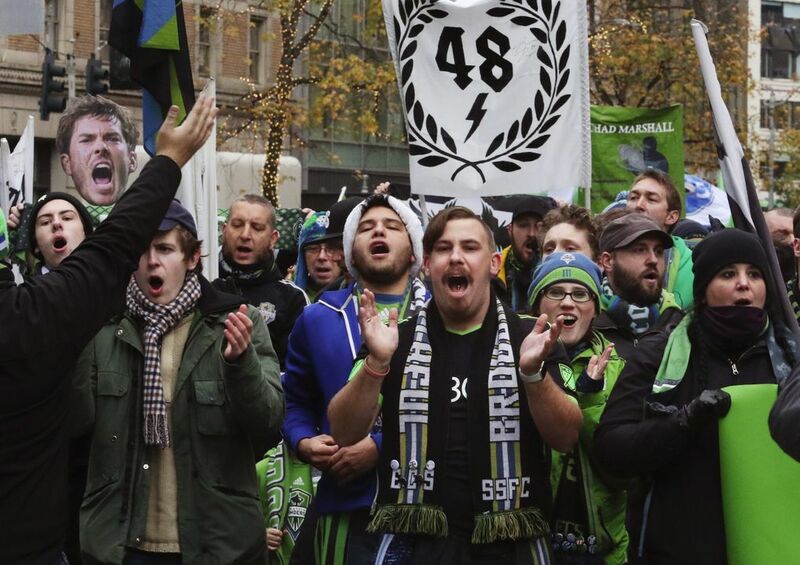 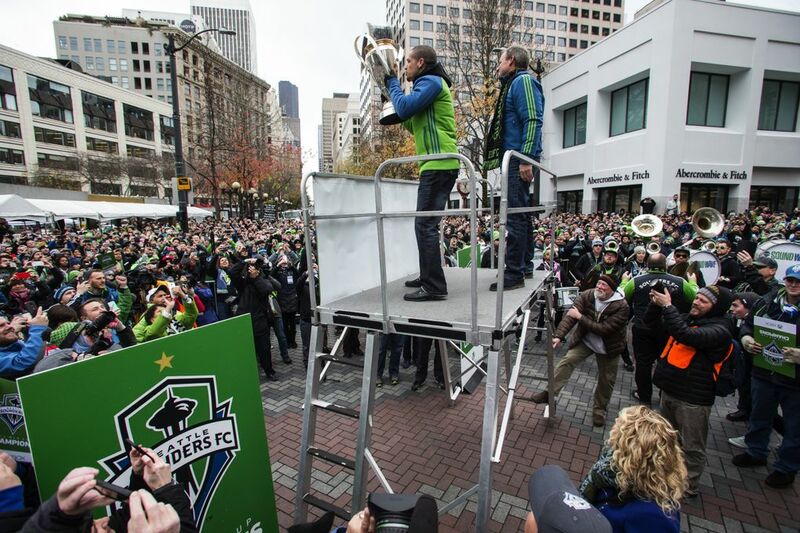 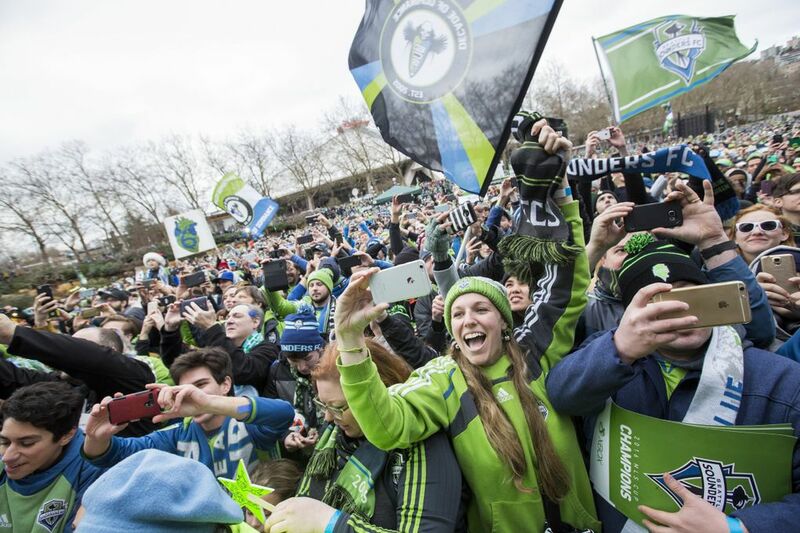 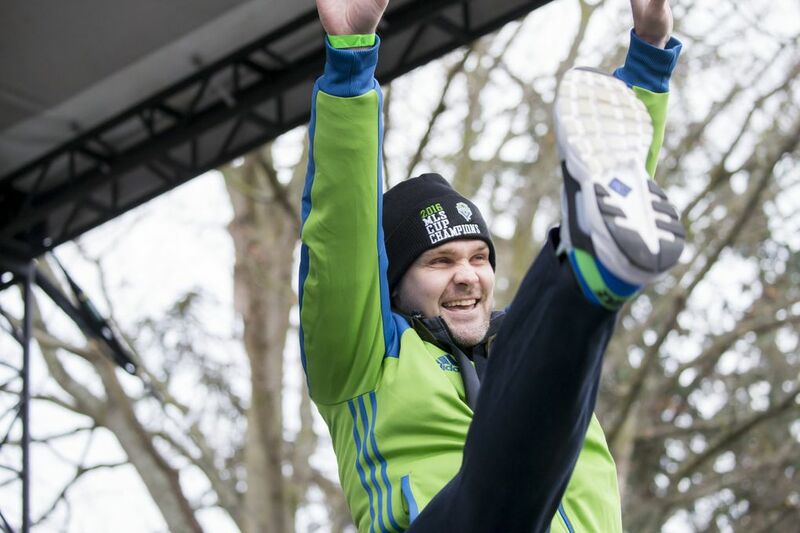 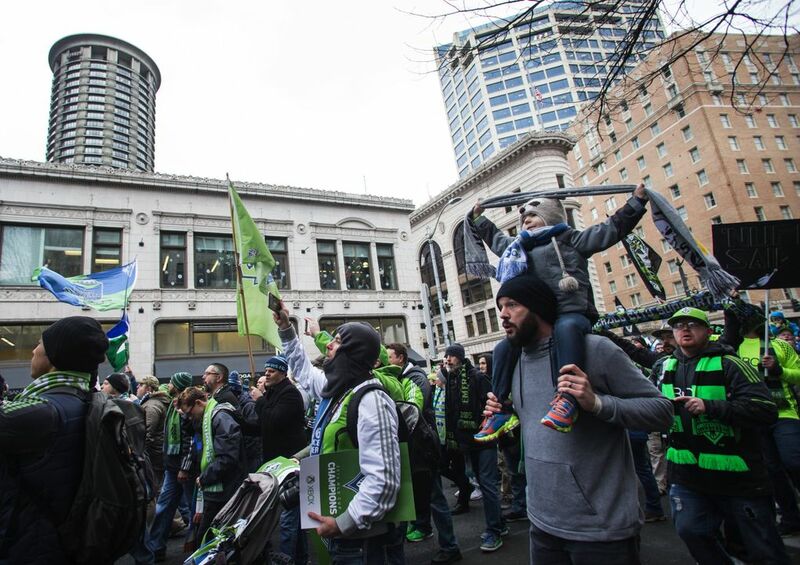 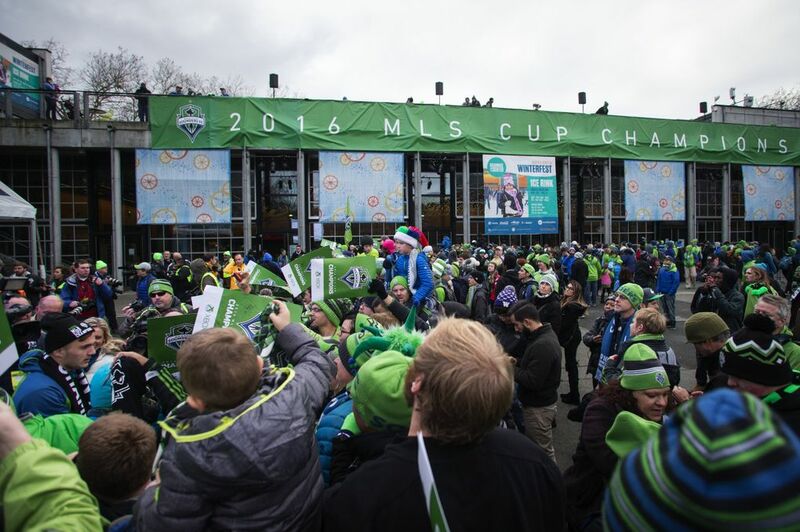 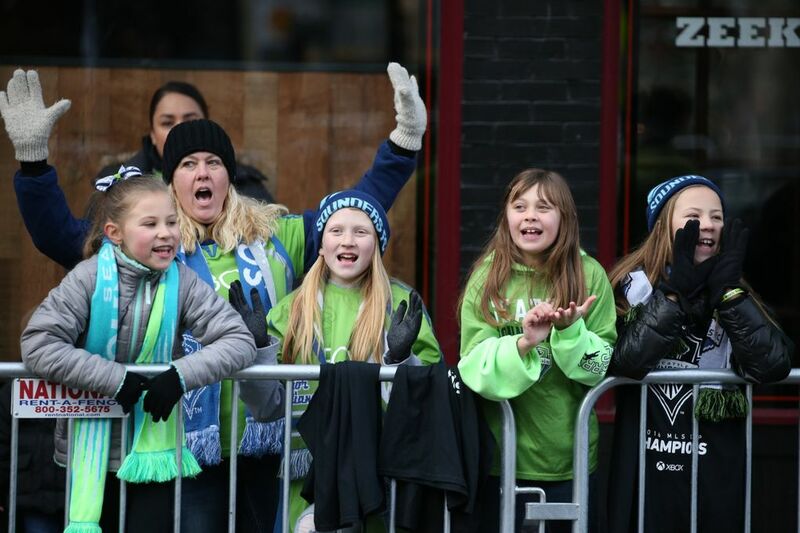 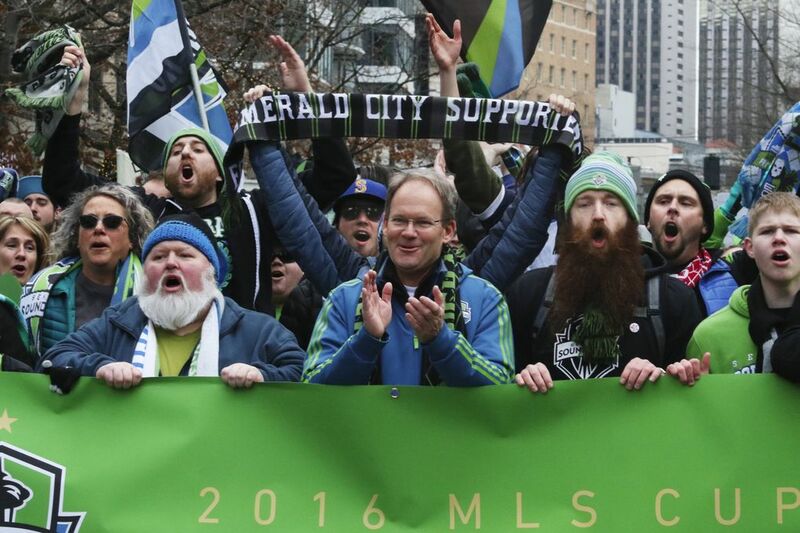 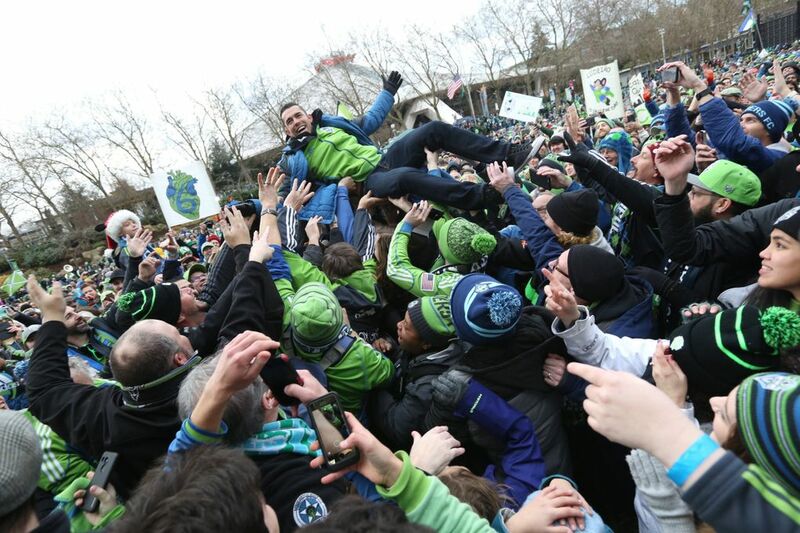 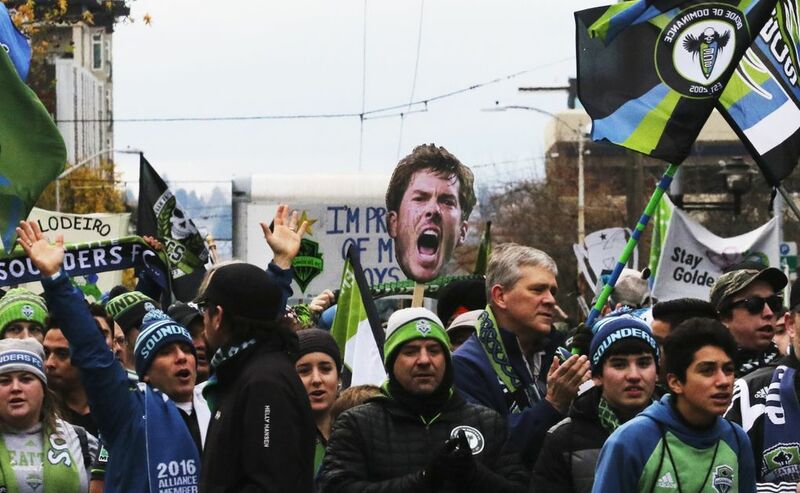 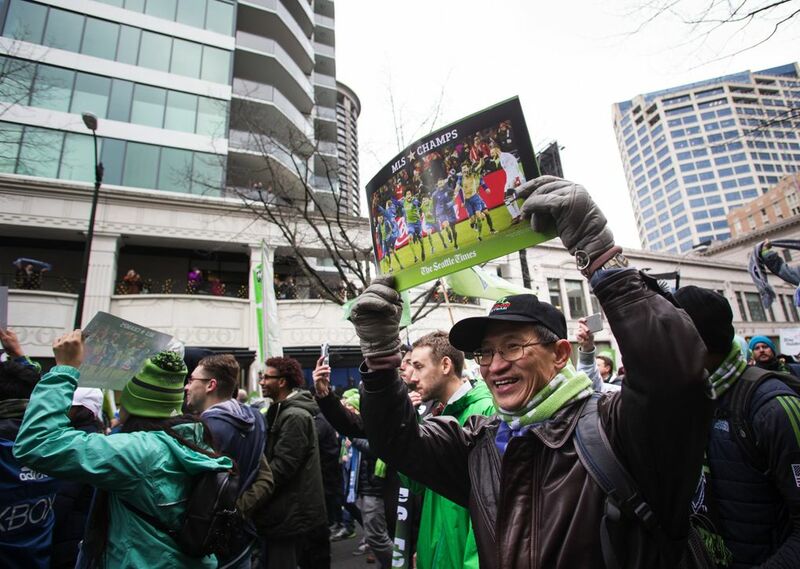 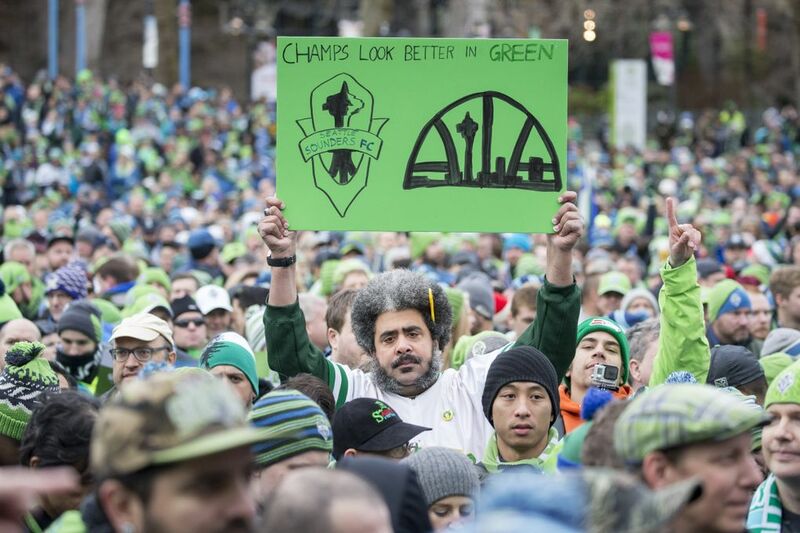 Here’s a look at the scene from the Sounders rally and march. 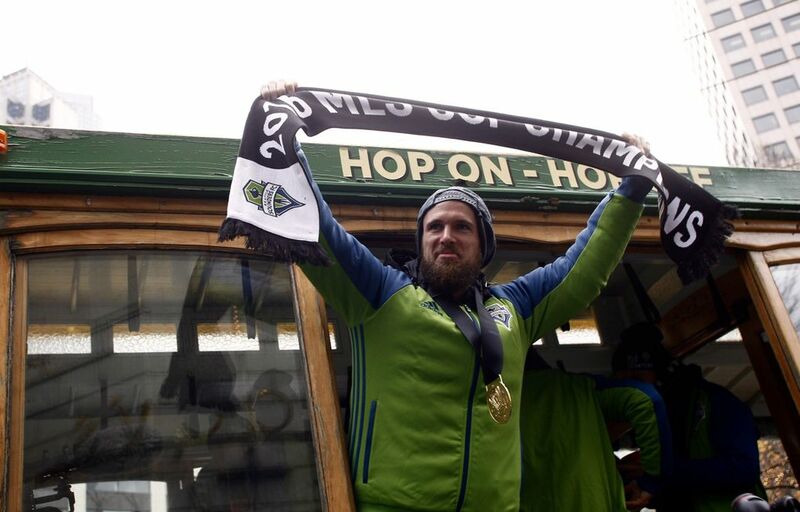 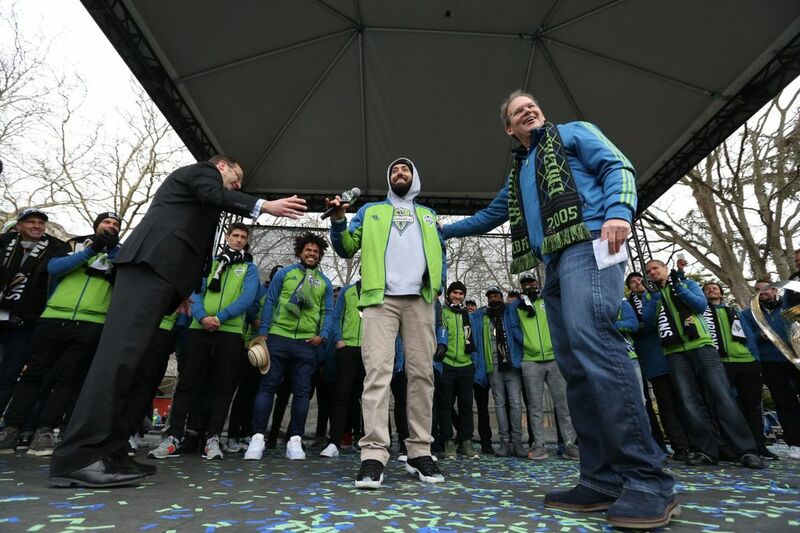 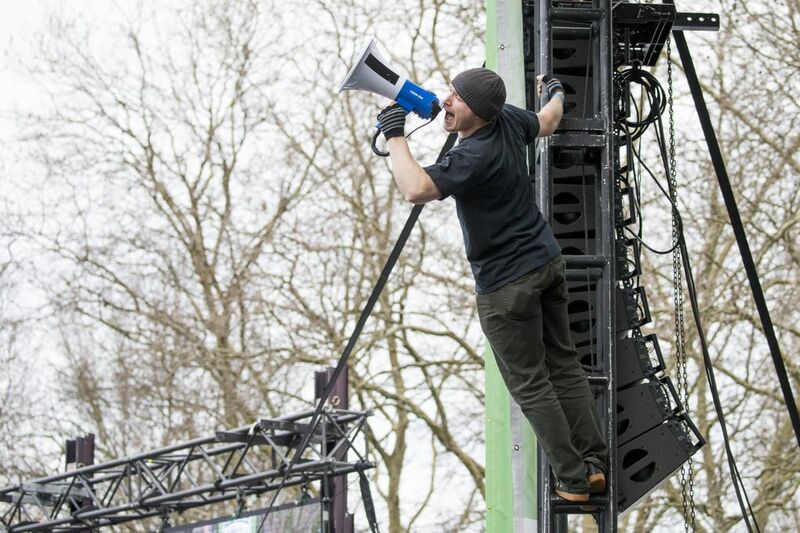 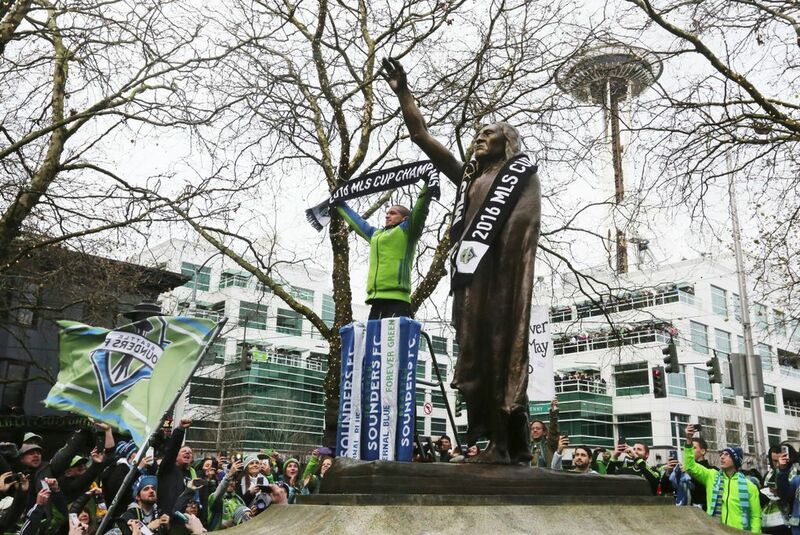 Seattle Sounders FC and fans march through Seattle to celebrate its first MLS Cup championship, and Osvaldo Alonso stops to hold up an MLS Champs scarf at the statue of Chief Seattle at Tilikum Place. 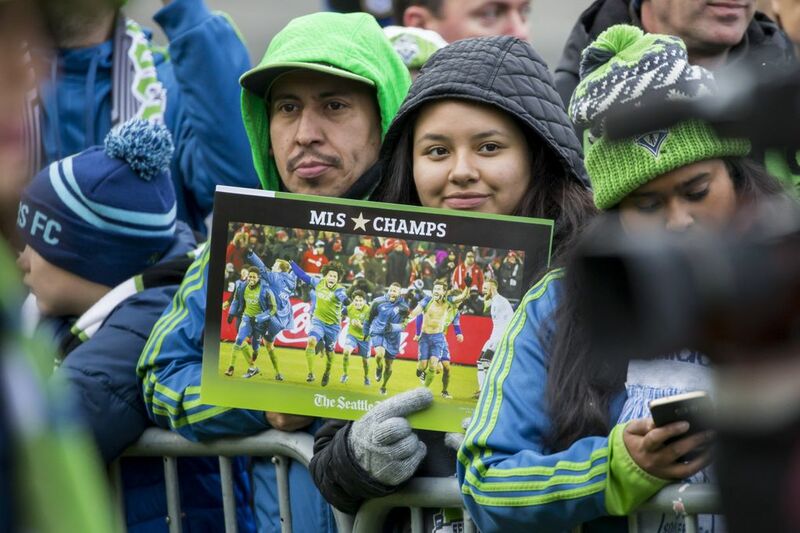 (Danny Gawlowski / The Seattle Times). 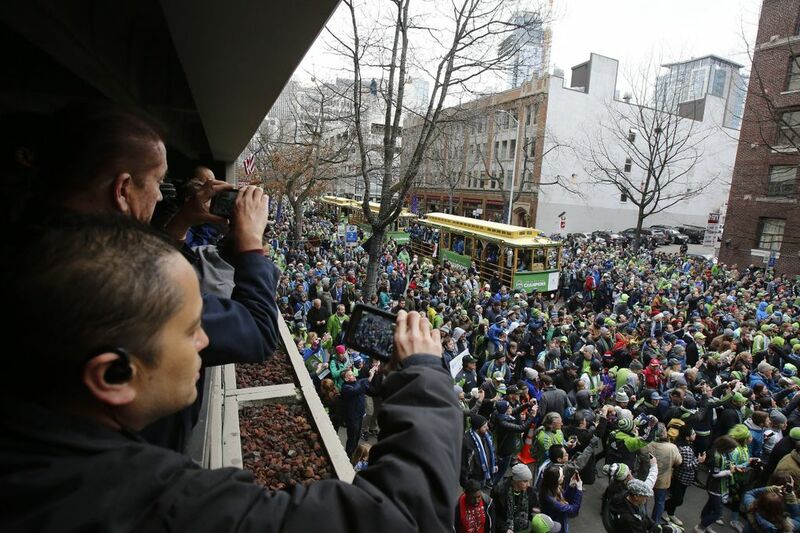 Mayor Ed Murray talking to crowd at Seattle Center. 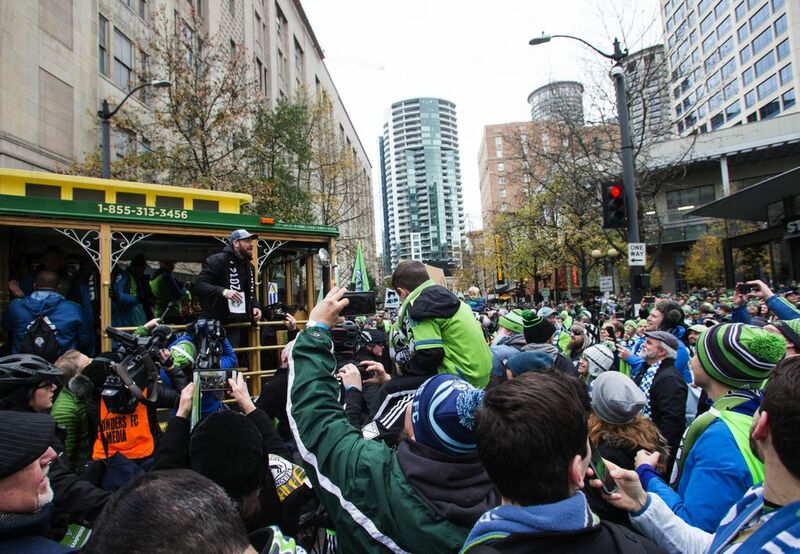 Murray acknowledged injured officer and asks crowd to cheer officers for the work they do in the city. 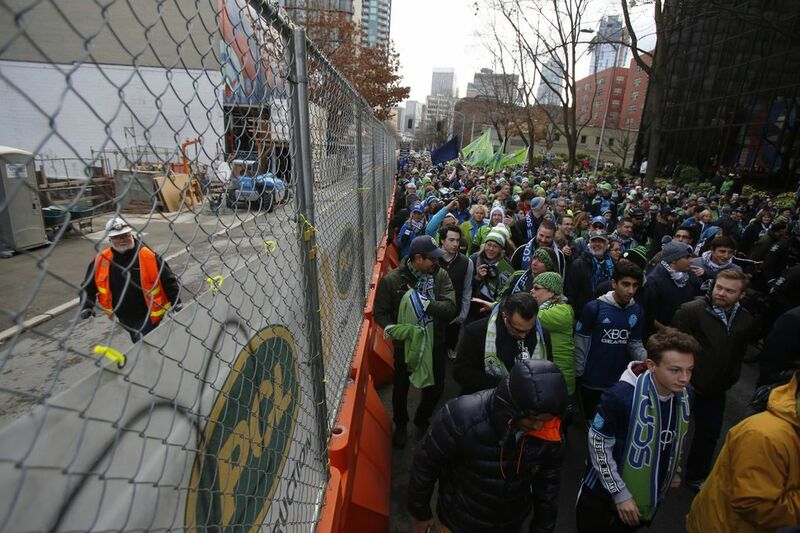 Here’s what the scene looks like. 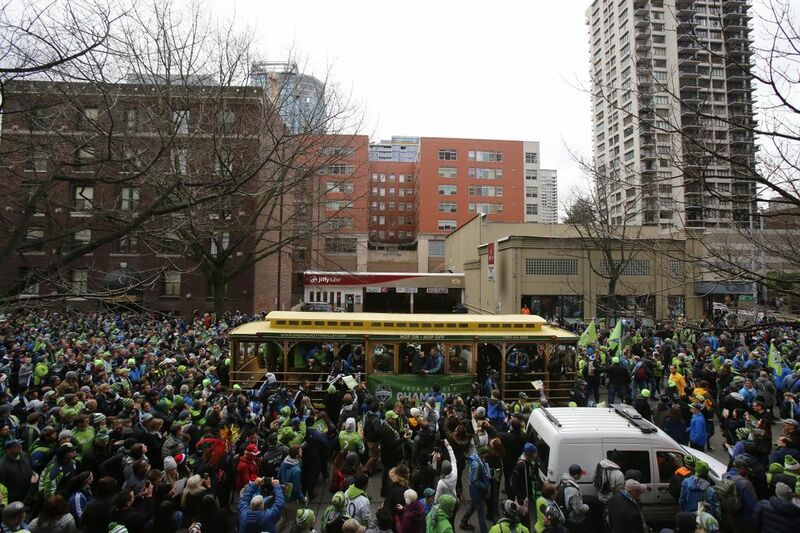 A trolley has hit a Seattle Police bike officer at Queen Anne Ave. and Mercer St. More updates to come. 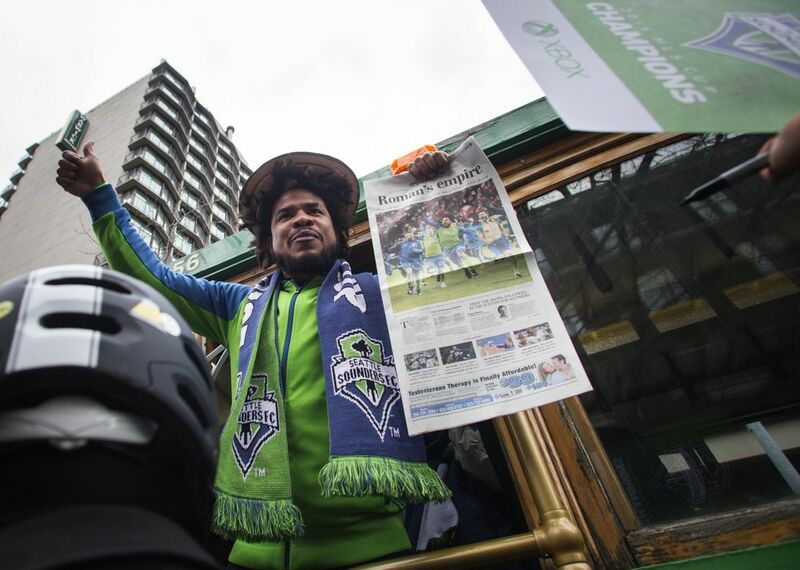 Bike officer injured in collision with trolley near parade route at Queen Anne Av/Mercer St. More details as they become available. 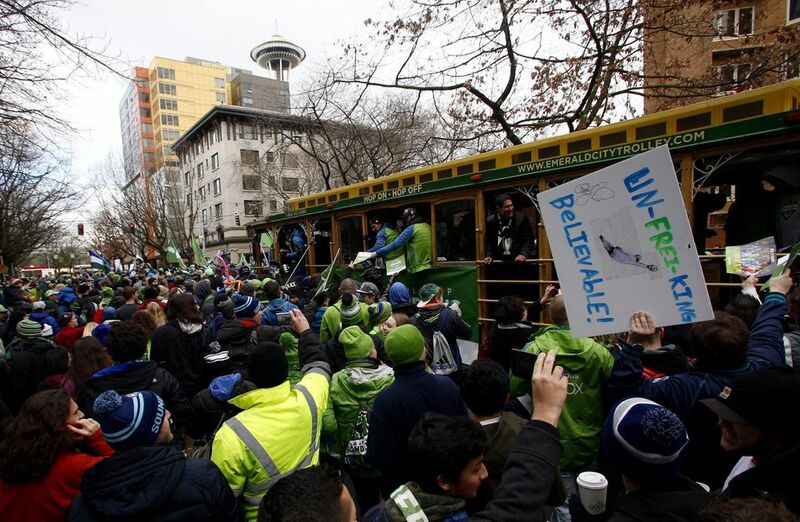 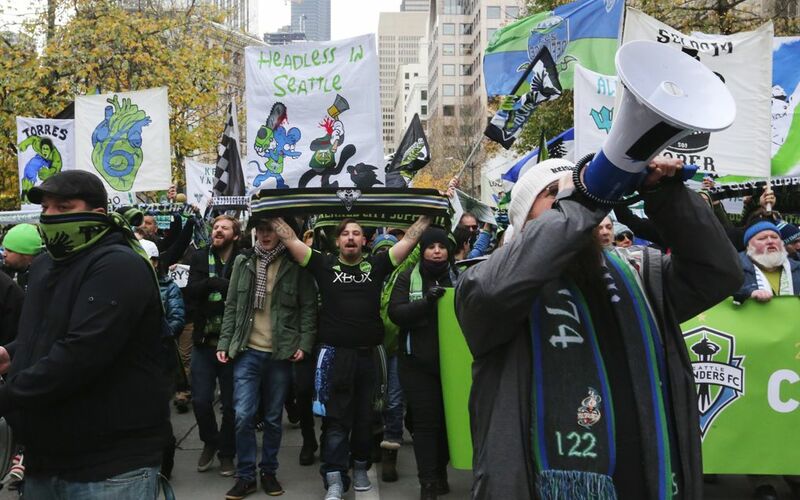 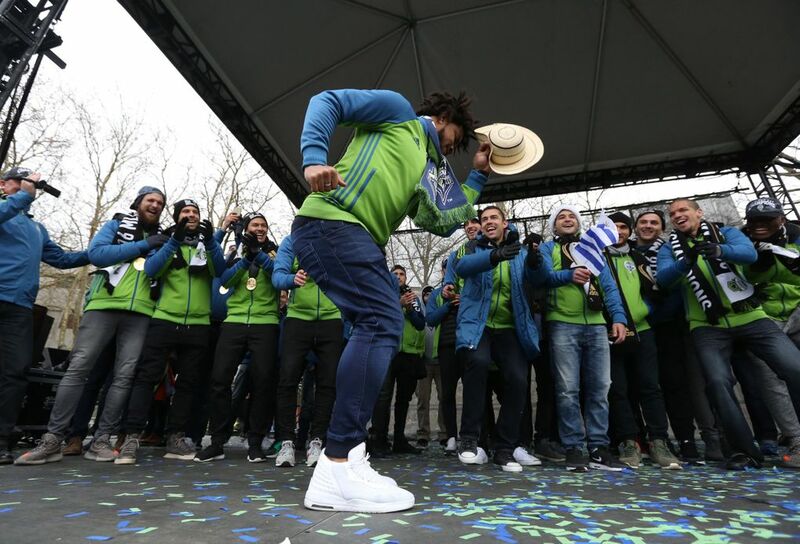 The march arrives at Seattle Center, where fans will gather on the Fisher Lawn and fountain mall for a rally, set to begin at 12:30 p.m.
Seattle police offer a helpful tip to fans: Don’t try boarding the Sounders FC trolleys. 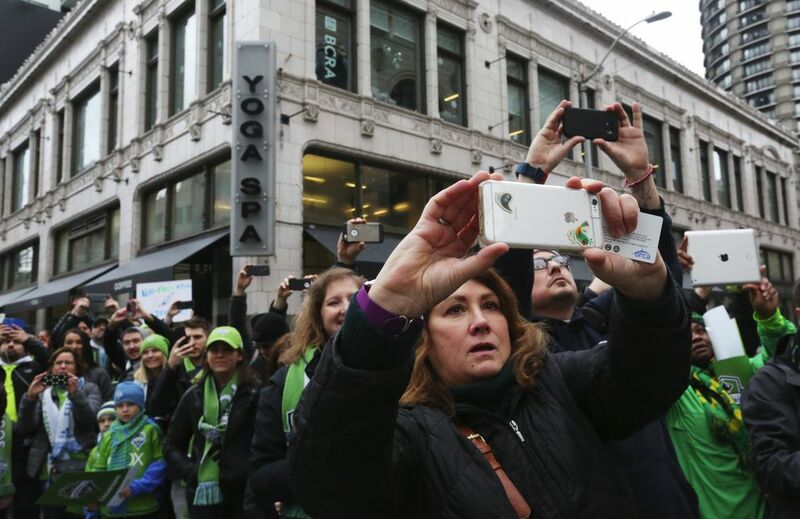 Two people have already been arrested. 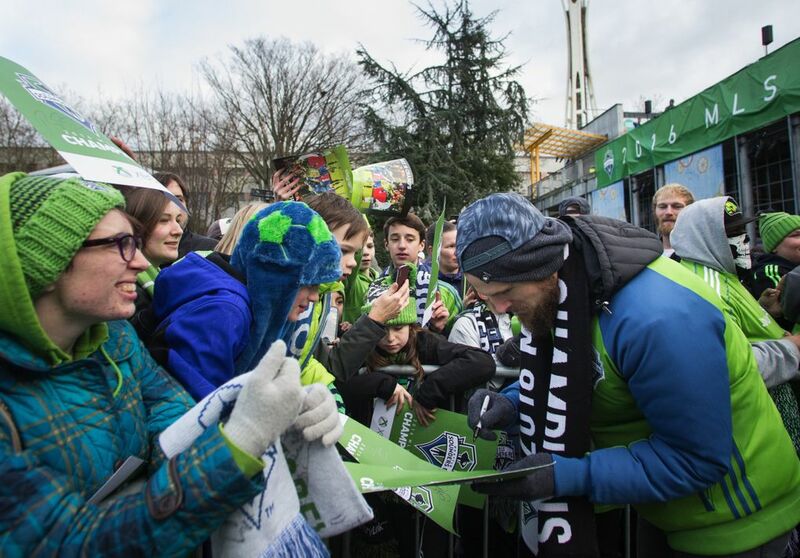 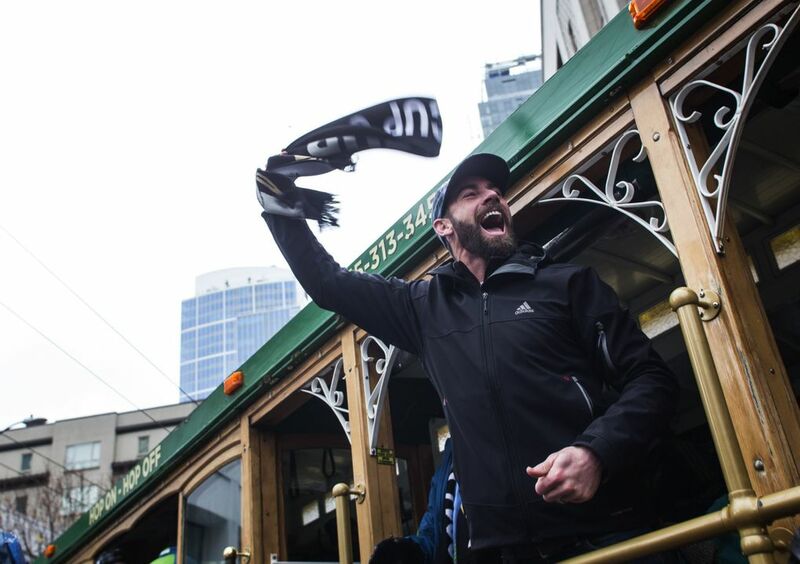 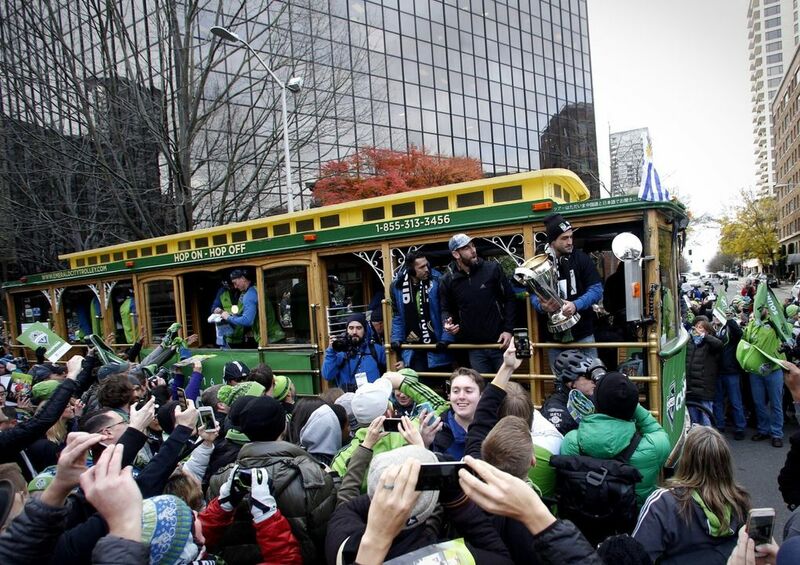 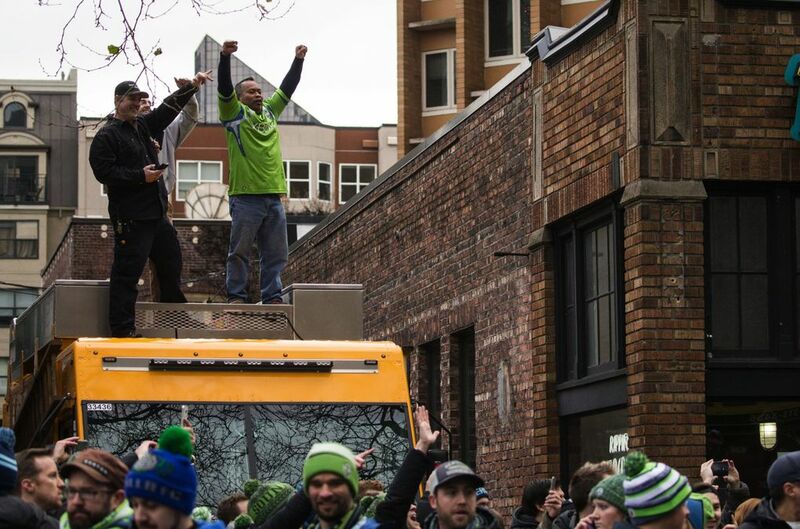 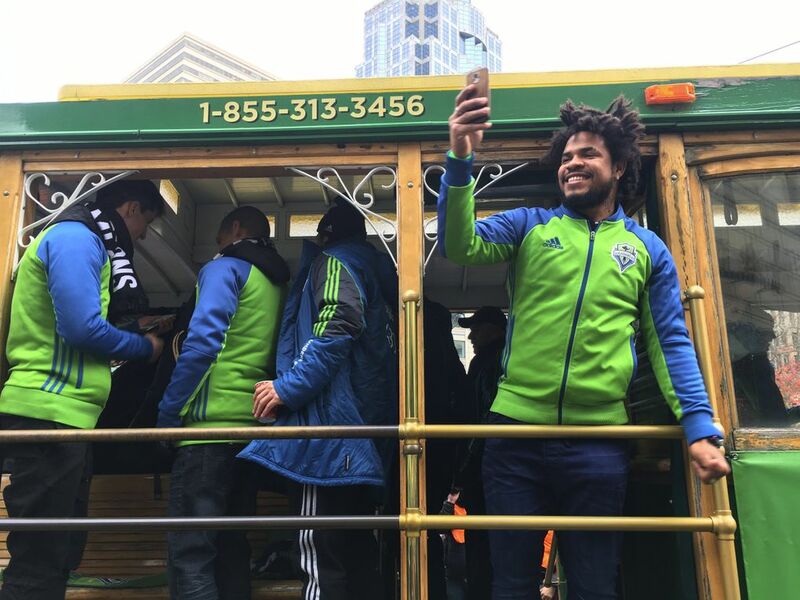 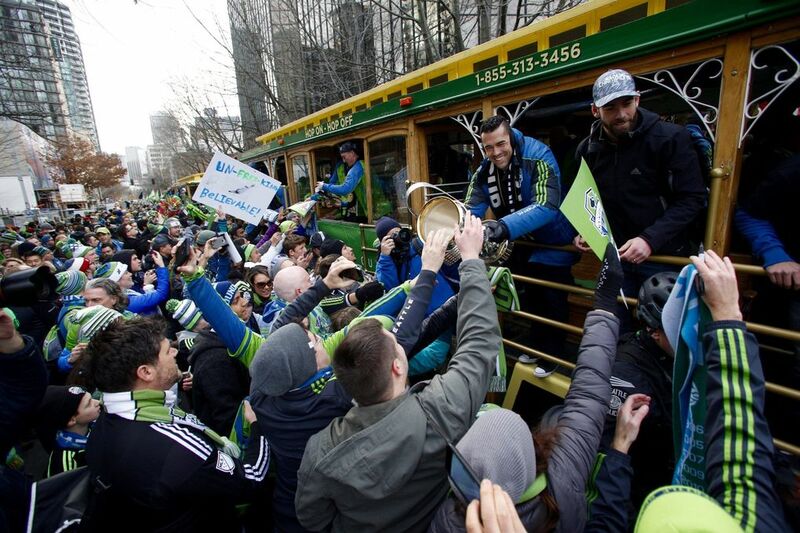 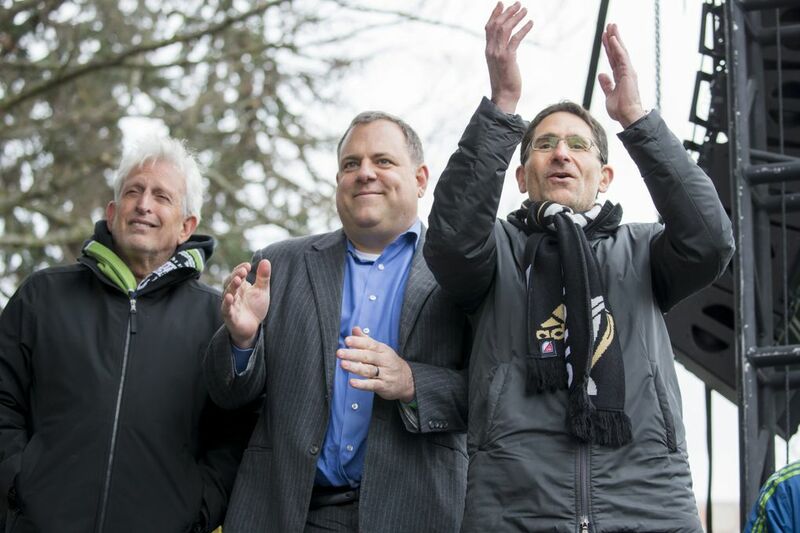 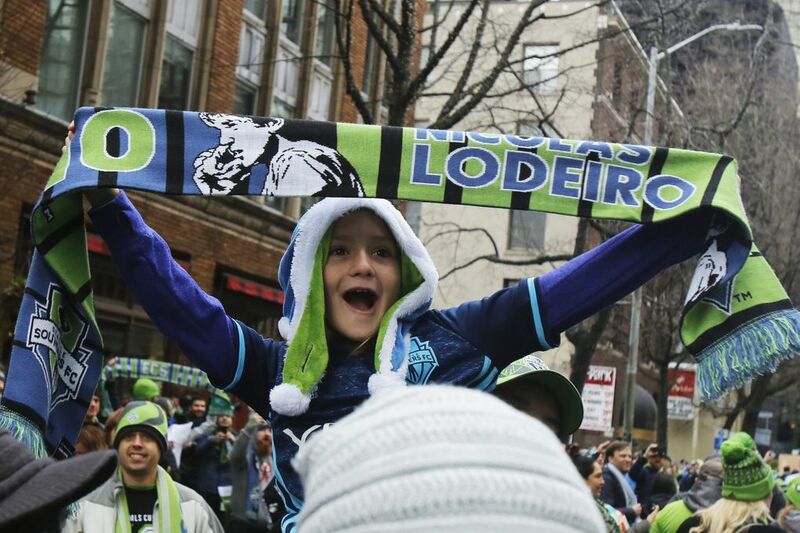 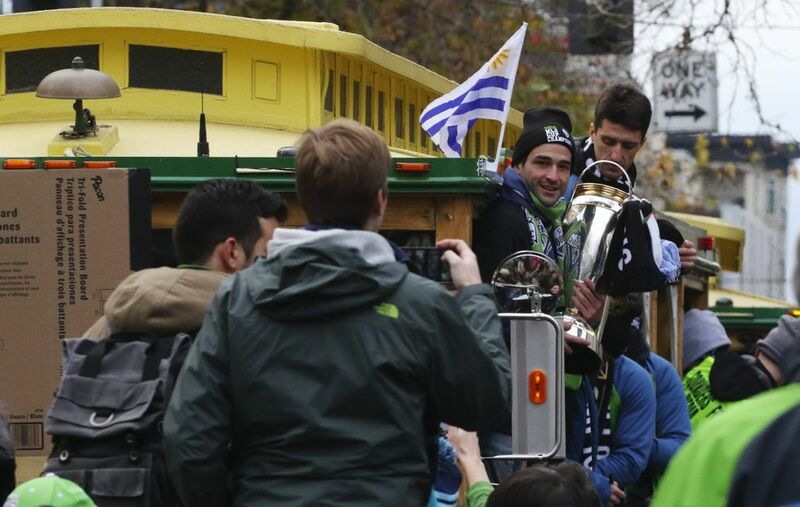 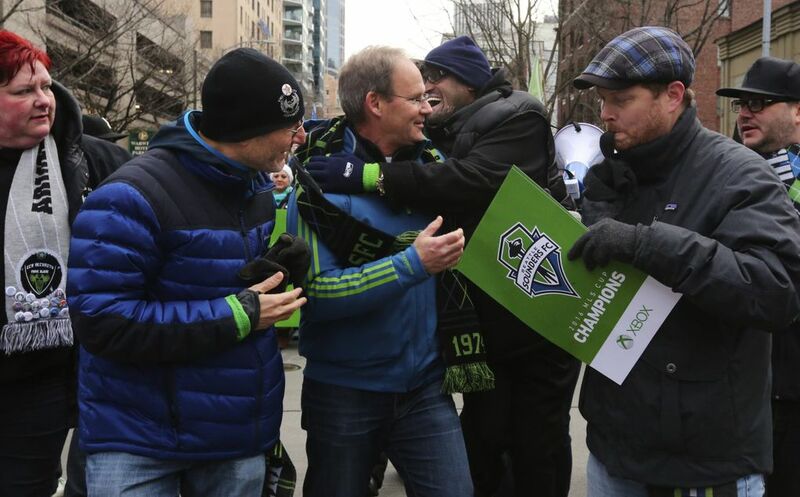 #SoundersMarch etiquette pro-tip: Don’t try & board the @SoundersFC trolleys. 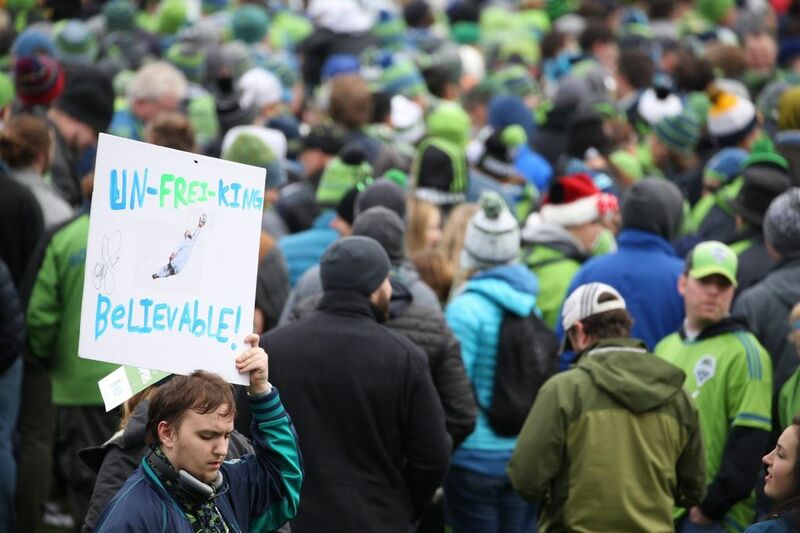 Two people under arrest for this so far. 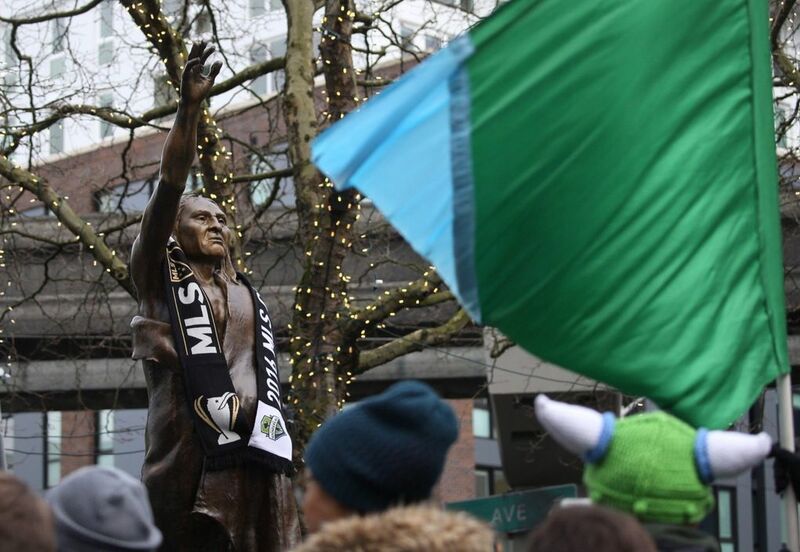 The Sounders have reached Tilikum Place. 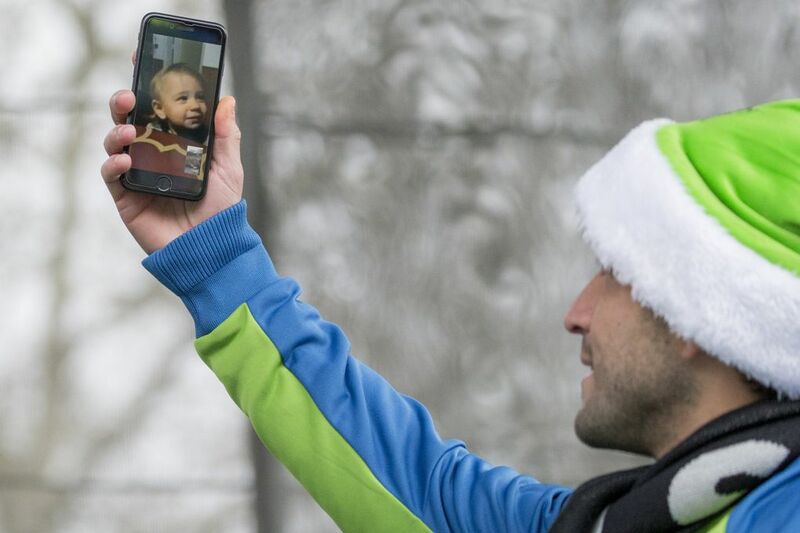 Here’s our live video. 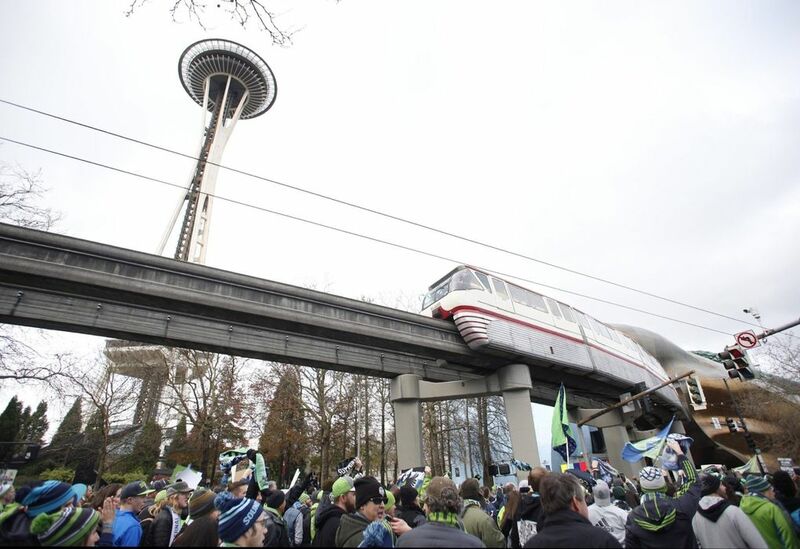 A woman has been arrested on suspicion of trespassing. 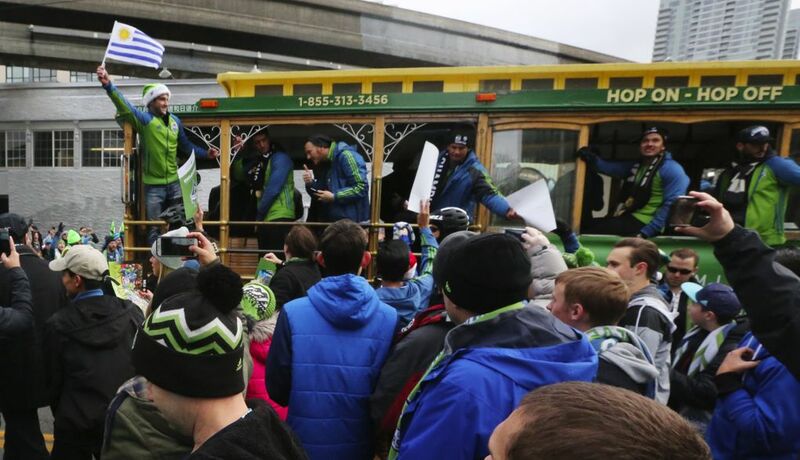 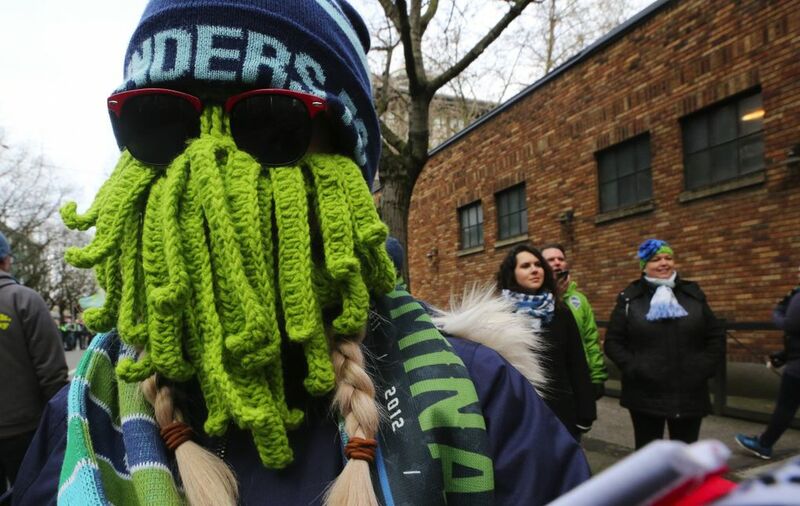 Police said she was trying to board the Sounders trolleys. 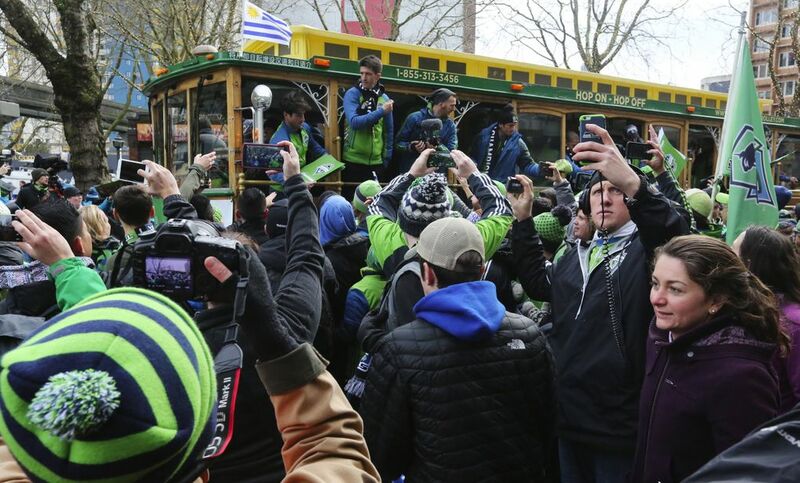 Swaths of fans in rave green surround multiple trolleys as Sounders FC players move north up Fourth Avenue.